We're well used to tales of Stuart Lumb (a.k.a. Jet Set Super Vet) racing in exotic overseas locations and more often than not, in off-road action at some international XTERRA or Championship Cross Triathlon event. 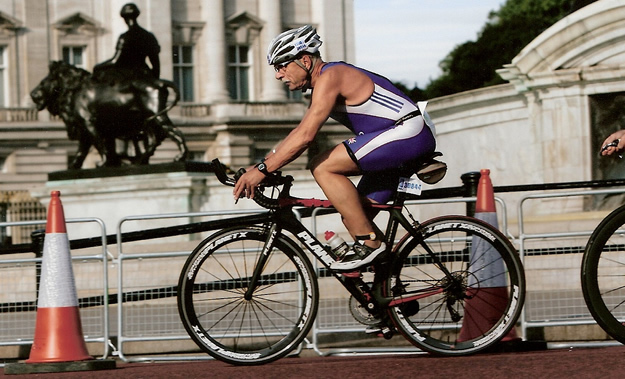 Stuart managed to both stay on home soil ('Yorkshireman comes to London') and leave his MTB at home as he joined the other 1200 GB Age Groupers at the Hyde Park World Championships in September, racing over the Standard distance. (You can check out Stuart's Tri247 column archive HERE). Every five years as I move up an Age Group I think (mistakenly), that I can go out and crack eggs with big sticks or rather, rocket up the rankings. That might have been the case 10 years ago, but now that triathlon is the in thing to do and the best thing since sliced bread, guys are coming out of the woodwork to compete, so even as a Vintage athlete there is now very healthy competition. Darwin's theory of evolution, as I recall, was based on “Survival of the Fittest.” I keep thinking that at my tender age, injuries should reduce the number of my peers still racing, but in reality this just isn't the case. Also what shook me was that there were five guys in the age group above me who turned in faster times than me, although it was a World Championship plus the fact that I can't run to save my life tempers my performances, as good triathletes are first and foremost excellent runners. You can buy time with a good wetsuit and a featherweight bike, but being a good runner is all down to your genes – pure and simple. 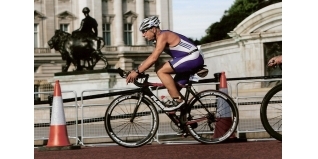 My last on road Worlds was the ill fated event held in Vancouver in 2008 and which ended up as a duathlon – bugger's muddle is putting it politely - so I lived in high hopes that London would get it right. The numbers were mind boggling – around 1200 in the British squad alone (Aquathlon, Sprint and Standard distance), with around 2800 in the standard event – but it all went off extremely well. 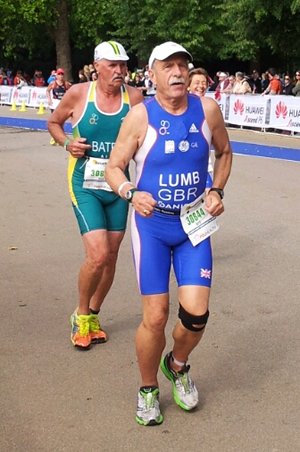 Competition to get in the GB squad was extreme - in the third qualifier/ British Championships in Liverpool you had, in many Age Groups, 80 guys chasing seven slots – just manic. I'd been in two minds about trying to qualify as I hoped to compete in the XTERRA Worlds this year, as well. Anyway, the chance to race over the Olympic (albeit very flat), circuit and race in the footsteps of my fellow star Yorkshiremen, the meteoric Brownlee Brothers, swung it for me. Also, being a tight fisted Tyke it meant I could get one last airing out of my Adidas trisuit. Next year I'll have to buy a new one whilst having a perfectly good old one sat in my drawer. Also I prefer a two piece, not least to hide my middle age spread! To swim in the Serpentine, bike round London on closed roads and run through Hyde Park has to be up there in my racing highlights. I'd used Nirvana before and they came up trumps, at quite late notice, with a room in the Copthorne Tara, which was just 20 minutes walk from the race venue. Bike racking took place on the Saturday and I duly found the allotted place for my pride and joy, my new Planet X N2A, on which I'd fitted my Ironman tri bars. Planet X are based in Rotherham, just an hour's drive from my home. They have a large showroom displaying all their bike range, plus you can literally have your bike custom built. As usual, JSSV's bikes are better than the rider! Race day dawned, chilly but at least fine. Because of the huge numbers racing, transition closed at 6.30am and some athletes only just made it in time. That meant getting to transition in the breaking dawn and as I tripped over a tree root I wished I'd remembered to bring a torch with me. My wave didn't start for a while so it got a bit nippy hanging around, in fact, some guys racing well on in the morning went back to bed in their hotels; a wise move. 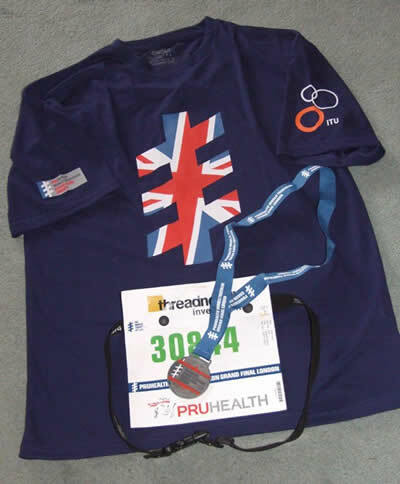 I was the sole male Barracuda in the GB squad, along with Barracuda lady Lucy Khan, who kindly zipped me up. The air temp was around 11°c and there was hoarfrost on the pontoon – hence the swim was cut to 750m, although the water itself wasn't that cold. The day had dawned dull and overcast and so I opted for my clear swim mask. Sod's law - as we jumped into the Serpentine the sun decided to spoil the party and suddenly appeared through the clouds, plus most of the swim was due east. My sighting had improved since my terrible sea swim in Den Haag in the Euro Cross Tri event in 2012, although swimming into the sun is always a hit and miss affair. Anyway, I hit the exit ramp spot on, more by good luck than good management, and so it was off to T1, on with my Bell helmet, courtesy of Danisco, and on to the bike split. As the run split unfolded I noticed I had the Old Enemy alongside me – an Aussie in my AG called Daryl Bates - and was worried he'd take me, but he just kept on my shoulder. After the third lap the course took in a 180 degree turn, just before the finish. I can't sprint to save my life, but was desperately hoping my Aussie limpet couldn't either! So as we turned and had the finish gantry in our sights JSSV “kicked” and eventually beat his Antipodean adversary by all of two seconds (too bad those tactics didn't work for Jonny B in exactly that same place later that same afternoon...). I collected my nice medal, to add to my collection and was delighted to see that my AG World Ranking had gone from 30th to 27th, plus I was third Brit in my AG, despite having a rather poor run. It was a pity the swim was halved as it's my second best discipline, so my ranking might have been better, but c'est la vie. Anyway, all in all, not a bad day at the office. Well done Stuart - Jet Set Super Vet strikes again.